These plump-leaved colorful plants store water in their juicy tissues, making them a forgetful gardener’s dream. Give them well-drained soil and plenty of sun, and your succulents will look as healthy when you return from vacation as when you left. In fact, they may look even better. 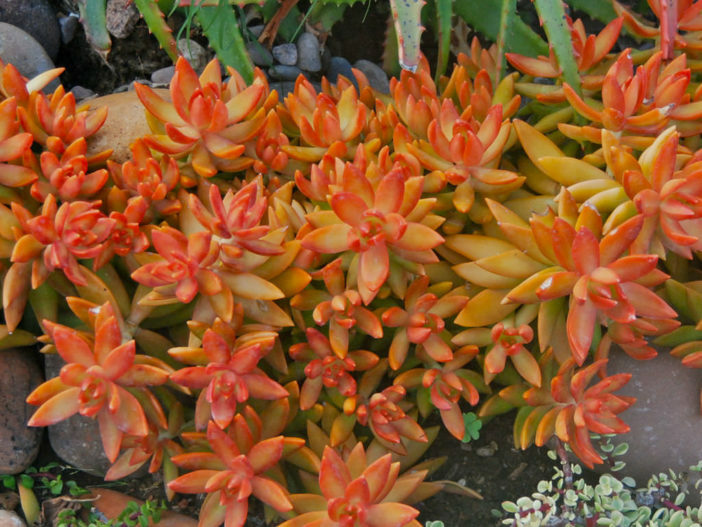 That is because stressors that might harm or even kill other plants (an extra touch of sun, heat or cold, even a drought resulting from the gardener’s vacation) make many succulents come alive with color. Normally green and blue-green leaves heat up into a vivid spectrum of reds, orange, pinks, purples and yellows. Especially during the cooler months, this cultivar’s leaves take on bright golden centers with ochre margins. From late fall to winter, look for white flowers tinged with lavender. 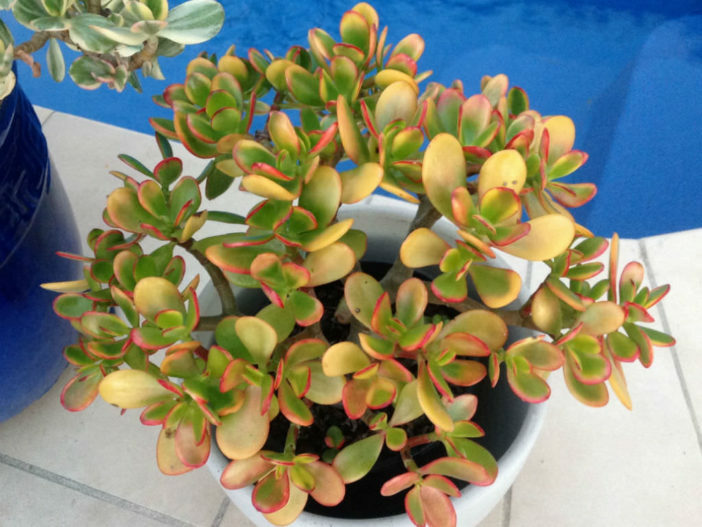 Why we love it: In shade, it masquerades as its plainer green cousin, the common Jade Plant. What’s more fun than a plant with a secret identity? 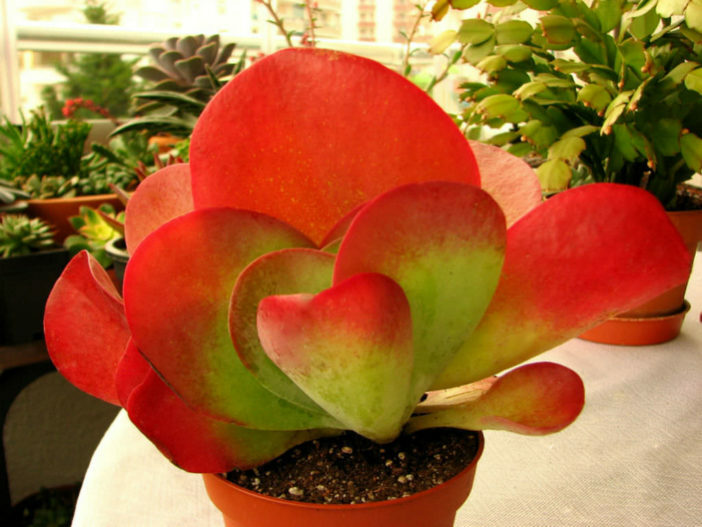 The flat, round leaves of this succulent—also known as Desert Cabbage and Flipping Flapjacks—can grow up to 6 inches (15 cm) in diameter. They begin to blaze red from their tips downward, growing more vibrant with additional sun or cold. From late winter through early spring, pale-yellow blooms open, a pleasing contrast to the fiery leaves. 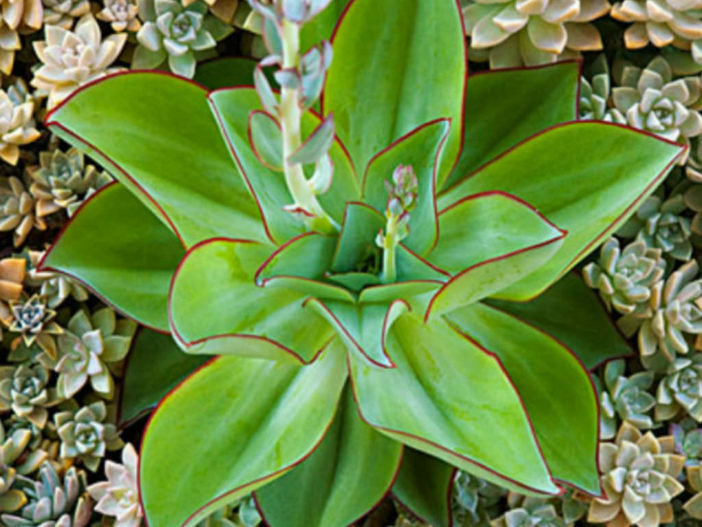 Why we love it: The color and pattern of the leaves make this a simply stunning plant. With a thicket of loosely branching vertical stems, each about the diameter of a pencil, sticks on fire looks almost like something growing on an undersea reef. 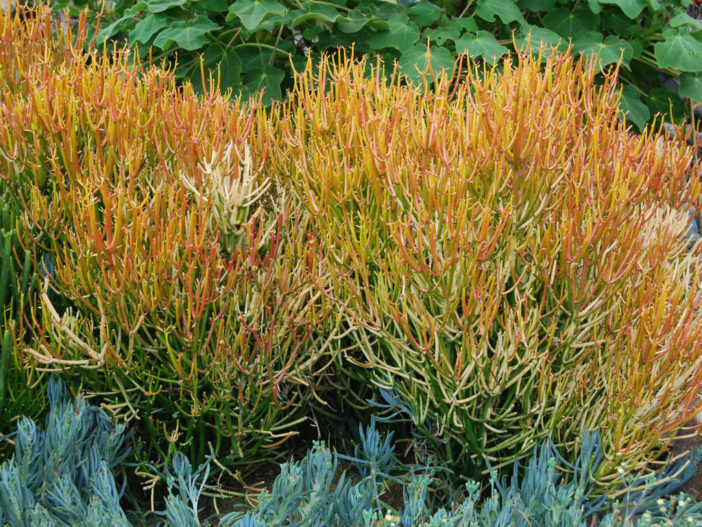 Also called Red Pencil Plant, it has tips that turn yellow in summer and red in winter. Why we love it: Height and shape make this the perfect thriller in any container, while the changing colors ensure a fabulous show. Wavy tapered leaves overlap to form rosettes roughly a foot in diameter. Coloring ranges from blue-green leaves with red-purple margins to sea-foam-green leaves edged with dark pink. Why we love it: When backlit, the slightly translucent quality of the leaves becomes apparent, and the red margins glow neon bright. Dark-green leaves with white or yellow prickles bake into hot colors under direct sunlight. But peek at the shaded surfaces underneath and you’ll find tender greenery. Why we love it: Vibrant red-orange flowers shoot up on slender stems during summer, offering nectar your hummingbirds will find hard to resist. The stacked geometric leaves of Jade Necklace prefer some sun protection yet will still reward you with a rosy blush. In winter, pretty white blooms emerge from the ends of the leaf strands. 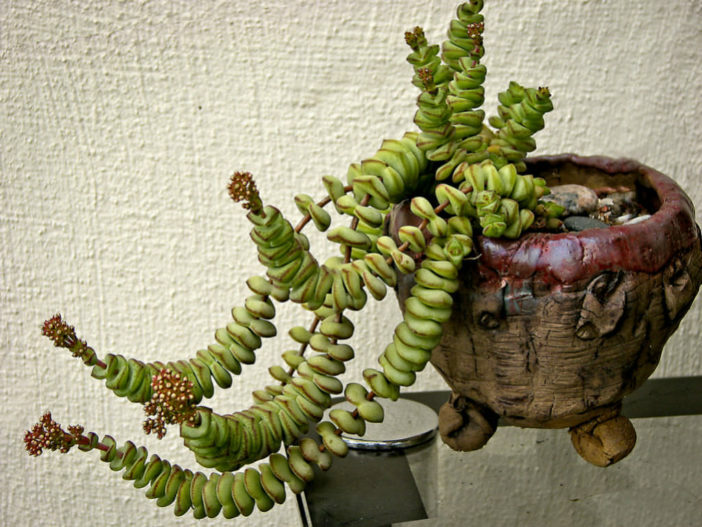 Why we love it: When planted front and center in a container, the strands of leaves turn upward like eels, making Jade Necklace a fun three-dimensional spiller. A succulent this stunning must be hard to grow, right? Nope! This cultivar is among the most user-friendly you’ll find. Preferring a soil slightly richer in organic matter than most succulents, it flourishes under ultrabright indirect light. Why we love it: Gorgeous powdery leaves splay open like a water lily or lotus blossom—but this Echeveria’s “flower” is always in bloom. Aeoniums prefer a little more shade and humidity than the typical succulent, but they’re still some of the easiest blooms to grow. 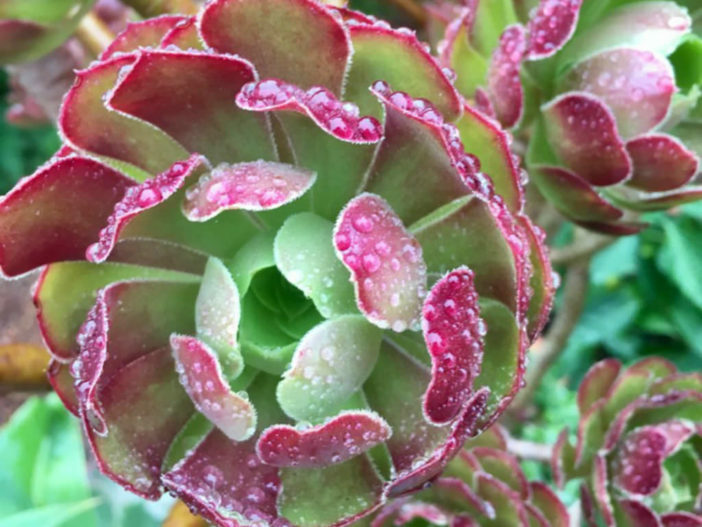 The large, well-defined rosettes of this red-and-green Aeonium will add class to your containers. Why we love it: It has the bicolor charm of the popular Green Envy Coneflower, but it’s colorful all year long. Why settle for plain old Hens and Chicks when you can have a gorgeous chocolate-tipped Royanum? 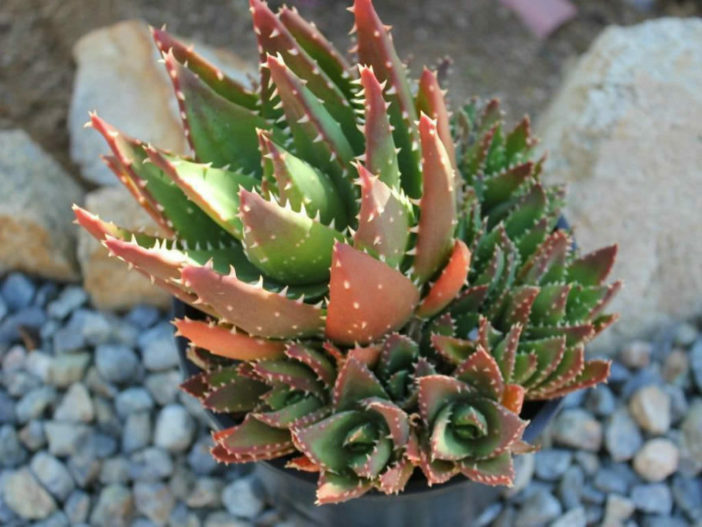 A frost-tolerant, cold-climate succulent, it can be safely grown from USDA Zones 4 to 9. Why we love it: Coordinate your container to match the tips’ hue, and you’ll be amazed how the colors pop. The trailing cylindrical leaves of this beauty turn a magnificent gold in the summer sun. Pure-white flowers bloom early, from January through April. Why we love it: Between the winter blooms and the summer leaves, this Sedum brightens gardens and windowsills year-round.